You can browse our full list of petitions that cover a wide range of today's political issues at FaxCongress. We publish your petitions and organize them by categories to make it easier to find causes you may be interested in supporting. Our free keyword search tool helps you quickly find or sign a petition on your favorite topic. FaxCongress provides you the opportunity to instantly fax your petition to Congress on current political issues that you strongly believe in. Our website is committed to fair and non-partisan treatment for all those who wish to participate with us in building a stronger democracy. We want to help you raise political awareness for your cause and start to achieve real change. We publish petitions that deal with both conservative vs. progressive social values, and we invite people to voice both sides of issues such as fiscally small government vs. large government. You can search our 7 categories including a place for petitions on defense and foreign policies from both progressive and conservative viewpoints. Each petition you write and publish will be placed into one of our categories so like-minded individuals can browse through the list to find petitions they want to sign and give their support to. We will fax any petition you sign to your Congressperson for free! FaxCongress is designed to be a perfect forum for networking like-minded individuals together and growing their base of support for ideas that they feel passionate about. We encourage citizen-led grassroots lobbying to solving political issues in America today. 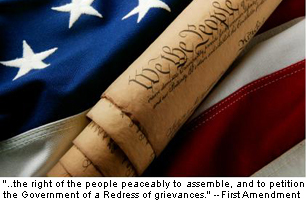 We know there are many people out there with strong convictions regarding the current political issues facing America. Why not act on those ideas now and create a petition that we can help you recruit public support for, and fax to your Congressman for free? If you choose to publish your petition on our site free, you just might start your own grassroots movement and build a new political platform for your cause! Use FaxCongress to create a petition that will allow you to gather support and raise money for your cause. For our great country to remain strong, we the people need citizen activists to take action on political issues in America.